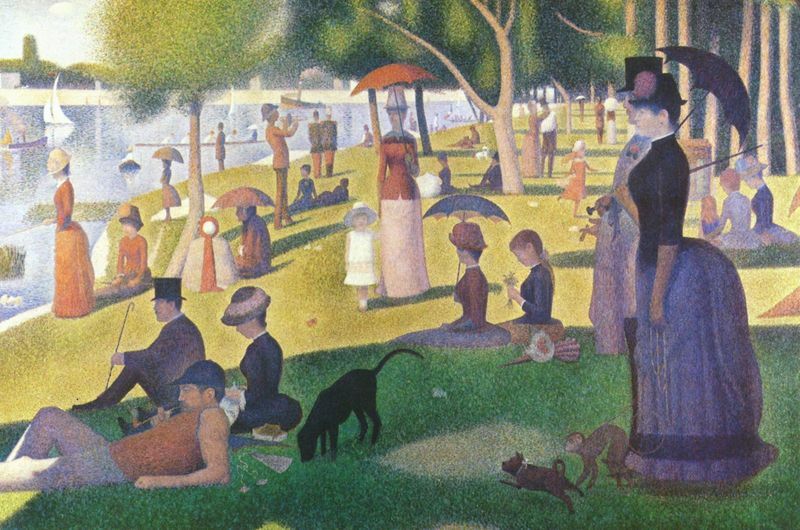 At the conclusion of the first act of the musical production Sunday in the Park with George, we watch the visual representation of the creative process of the artist Georges Seurat that results in the magnificent painting “A Sunday on La Grande Jatte”, pictured here. Order. I greatly lack self-discipline. Always have. Yet it has become clear to me that my spiritual path requires some order by which I mean consistency. I cannot simply “be spiritual” whenever I feel like it. My spiritual path requires discipline and consistency if it is to bear benefit. I need a spiritual practice, be it reading scripture, meditating or praying, charitable work, or other manifestations of the journey. and I need to perform these and other spiritual acts on a regular basis. Much like physical exercise, the spiritual path requires regular work-outs. Design. Here I must address how much structure my spiritual practice requires to include the role of organized religion. For some, organized religion is at the center of their journey. For others, it is peripheral if present at all. Further, some work with structured prayers and readings while others rely on meditation. Finally, I must also decide what if any room I make for thoughts from other religions and philosophies. Balance. Many religions and philosophies espouse the importance of balance. For me, this is reflected in the challenge found in many religions to love my neighbor as myself. Love of self is not narcissism. It involves not only celebration of my gifts but a hard honest inventory of my failings. In other words, it involves seeing myself as bot Saint and Sinner. Harmony. This quality ensures that my spirituality is truly interpersonal. As an introvert, I am drawn to solitary practice. But the principle of harmony reminds me that, if my practice does not bring me back into the world as a practitioner of peace and compassion, then my practice is mere narcissism. I invite you, then, to reflect on how you are doing spiritually following Seurat’s guidelines for creativity. The results may not be as grand as Seurat’s magnificent painting but can hopefully bring you peace, satisfaction, and a bit of the kind of joy I feel when watching this beautiful scene. This entry was posted in psychology, spirituality and tagged A Sunday on La Grande Jatte, Georges Seurat, love of self, spiritual discipline. Bookmark the permalink. Thank you, Rich. For the joy.